Photo courtesy of Bill Young. The final day of competition for the British Juniors, apparatus finals. 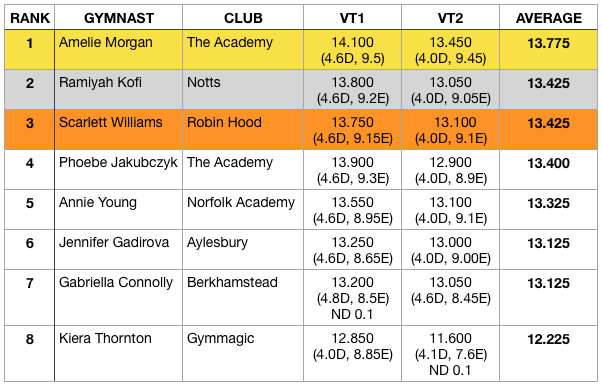 Top eight on each piece from the AA back to contend for the honour of being a British Championships medalist. Amelie Morgan took the vault title, beautifully stretched full twisting Yurchenko with a tiny hop, Amelie really does extend her vaults, no hit of a hip angle. Straight Yurchenko which looked so easy for her second vault, and title number two. Amelie today posted a video of her double twisting Yurchenko which is very nearly ready for competition, and it looks as lovely as the rest of her work. Ramiyah Kofi took silver, great vaulting from her. Tidy full twisting Yurchenko to start, good strong block, neat and under control the whole way through. Straight Yurchenko second vault, again good height, and nicely done, just a hop back on the landing. Scarlett Williams took bronze, another really nicely done full twisting Yurchenko, Scarlett is always lovely to watch as she’s a very clean gymnast all round. A beautifully stretched and stuck straight Yurchenko second vault to put her on the podium. Amelie Morgan took her third gold of the Championships on bars, the opening sequence of her routine starting and finishing with two beautiful casts to stretched handstand. Cast number one right on top of the bar, then Maloney, shoot half into handstand, shoot up to the high bar, and stretched cast number two. The E rated piked Jaeger was a lot better today than in the AA, really high and flighty. Sharp top turn and giant full keeping her handstand shape throughout, high double tuck, another great routine. Phoebe Jakubczyk took silver, she pushed her opening cast to get the handstand which I always like to see, just over cooked it slightly though, but pulled it back well. The impressive Maloney to inbar Gienger followed, then another handstand pushed right up on top of the bar. A little short on her short clear today, nice toe on, giant full, and a fly away half dismount. I’m curious as to what dismount Phoebe is working, as I imagine she’s planning to upgrade the end of her routine. I could be wrong of course, but its likely a front away one, so perhaps we shall see either a double front, or twisting dismount from her in the future. Ondine Achampong took bronze, beautiful cast to handstand to open, followed by Stalder shoot to high bar. Another lovely stretched cast, and I really do see quite a lot of similarities in Amelie and Ondine. Toe on, blind in to Endo, straight into the lovely high straddled Jaeger. Giant half, giant full then winding up into an upgrade from the AA, she went for the full out dismount rather than the double tuck. A little low in the chest on landing, but she got it out there in competition, well done Ondine. Leah Greenland was the only gymnast to take gold here at the Junior British aside from Amelie Morgan, when she took the beam title. Flick to chest stand mount, change leap to split jump clean and extended. Sharp and snappy in the flick layout, a small adjustment on landing, determinedly brought back under control. Safely through the full spin, the free walkover, and the back tuck, nice side on straddle jump, and a double tuck that popped of the end of the beam. Leah kept the routine flowing, and performed confidently throughout with good energy, exactly what you want to see on this piece. Very well done Leah. Roshelle Spencer-Smith took silver, flick to chest stand mount, and change leap to open. Split jump straddle jump linked, smooth through the flick layout. Nicely through the full spin and the side somi, split jump side on, so popular now since the jump upgrades in the code. Punch front securely landed, and finishing with a strong double tuck, with just a small pace. Roshelle is a really smooth beam worker, she looks calm and composed throughout. Amelie Morgan took bronze, she played safer in the AA using her Yurchenko mount on its own, today she attempted the hugely difficult Yurchenko, flick layout mount series, didn’t come off for her this time, and she came away from the beam. Beautiful change leap, a little short on the change half today, then safely into the Korbut flick. A little wobble on her free walkover, the new ring jump safely landed. Lovely free cartwheel landed with style and confidence, split jump side on hitting full split. Clean double twist with a small hop to finish. Phoebe Jakubczyk took silver, and I love her new routine. A complete contrast in style to the other medalists today, and she performs it so well. Double Wolf turn to open, the new high full in so well landed, the absolute tiniest of adjustments only. Change through to split full leaps hitting her positions well, one and a half twist to straight front second tumble. A clean high change half, high double tuck with a small pace, great routine. Ondine Achampong took bronze, Popa jump in over box split to start, high double tuck with a hop back opening tumble. Full spin with her leg pulled right up to her face, second tumble of full twisting straight front to punch front, the tiniest hop to control the landing. Change leap through to split full, like Amelie, such impressive flexibility in her leaps. A little trouble on her triple twist today, she landed short and stumbled forward a pace to stand herself up. Finishing with a beautiful change to ring, a gymnast in the true classical style, Ondine is an absolute treat to watch. Lots of really lovely floors in this final, some beautiful gymnasts in the junior ranks.